Hardly anyone considers cooking cucumbers! In fact, to most the thought of cooking a cucumber is just plain wrong. And I understand where this belief comes from. 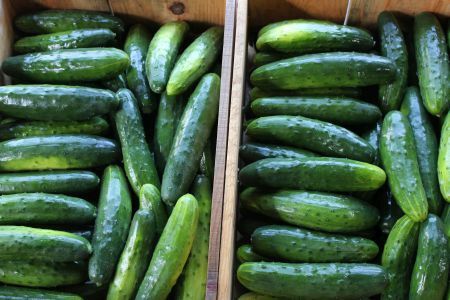 I grew up eating my cucumbers raw, too. But since having a CSA and then becoming a farmer, I realize that having extra produce like cucumbers around has helped me be more adventurous in the kitchen over the years. Now that I’ve tasted how good cucumbers are cooked, I want to help others try to it, too. Easy and simple: cooking cukes is no more complicated than summer squash or other summer stand-bys. But what do they taste like? Do they get mushy? Actually if you’ve never cooked cucumbers, you’re missing out on the taste! They become a whole different vegetable: Silky smooth, with a juicy, tender texture that still retains the right amount of crunch. Mmmm! To help you try it, here are our 4 favorite simple recipes, easy to make, and easy to love. So when you have too many cucumbers to eat raw, or just want to try something new, give one of these easy recipes a try. You just might love your cukes cooked as much as we do! Try it! So easy and delicious! Toss all ingredients in a bowl. Lay out on baking sheet and roast at 375 until soft. Cucumbers will not darken up so check for doneness by tasting and pricking. 30 minutes- 1 hour depending upon how thick they are cut. Turn 2-3 times to cook evenly. Got big ones? Try the Baked Stuffed Cucumber recipe on our recipe page HERE. SO good! Cucumbers are a secret ingredient in stir-fries! We recently made a stir-fry at home with cabbage, onion tops/scallions, and cucumbers! It was a big hit with the whole family and here’s the sauce Gene made to go on top. This could apply to any combo of veggies + cucumbers. Heat oil in large skillet on medium-high. Add veggies and stir-fry until desired tenderness, about 5-10 minutes. Meanwhile mix sauce ingredients together and whisk until combined. Pour over stir-fry and serve. Check and adjust salt to taste. Mmmm! This is a quick and easy way to cook cucumbers! I love the way the flavor changes with just a few minutes of sautéing. Try it! Slice the cucumber into ½” by ½” by 1” matchsticks. Heat butter in a skillet over medium heat. Add cucumbers and salt and sauté, stirring frequently until cucumbers begin to soften, 4-8 minutes. Check to see that they’re just tender not mushy. Remove from heat. Sprinkle with dill and black pepper. Serve hot topped with a spoonful of the optional sour cream. I recently made this soup for my in-laws and asked them to guess what was in it. They had no idea and the best thing they could come up with was potatoes! They loved it, as do we! Quick to make and easy to reheat, or eat cold. Combine cukes, onion and broth in a sauce pan and simmer for 20 minutes or until tender. Puree until smooth. Blend in sour cream, and season with salt and pepper to taste. Either chill and eat cold or serve warm immediately. Top with chives. Okay, are you still afraid to cook your cukes? I hope not and let me know if you try it! Like this blog post? Join our community email list below and get your free gift!